COLUMBUS, OH — A wacky, condensed schedule at Elite-Select Challenge wasn’t ideal, but there was still plenty of action in Columbus worth discussing. The weekend’s impact on the bid picture is likely the biggest thing to take away from the weekend, but there were other important storylines to emerge too. Here are all of my winners and losers from ESC. After a rough Saturday, in which they trailed in every game they played, Phoenix was much improved on Sunday. Perhaps it was Ashley Powell’s switch to denim overalls for bracket play, but they looked like a different team in semis and the final. 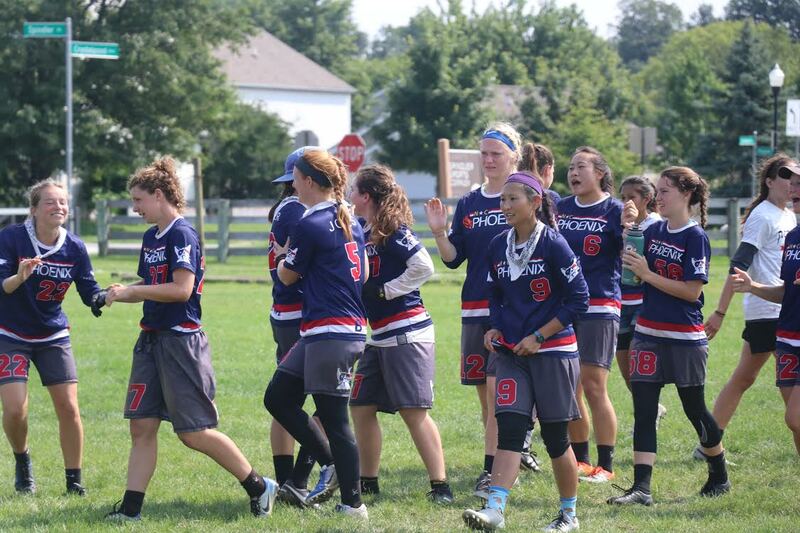 Jenny Wei came down with just about every disc that was in the air, and they were able to get enough breaks to beat Nemesis 13-11 in a well-fought final to take home the tournament crown. In the final, Phoenix was able to generate plenty of turns, thanks to impressive defensive performances from players like Mary Rippe and Brandi Skanes. It took pulling Powell and Jones over to the D-line for Phoenix to finally be able to convert on one of their break chances, though. They grabbed their first to make it 5-3, with Powell and Jones doing a lot of the work during the possession before Jones hit Rippe for the score. Phoenix got another right away to make it 6-3 with their two top handlers off the field, but didn’t score again the rest of the half. After no turns on their first four offensive points, Phoenix couldn’t keep a hold on the disc over their final three O-points of the half. Several times in those early points they came down with miraculous catches, or got away with some lucky throws, and those stopped falling for them in the second part of the half. Nemesis went on a run to take half up a break at 7-6. The second half was more back and forth, with neither team able to get consecutive breaks the rest of the way. Wei continued to be a force, cementing Player of the Game status, and Phoenix’s D-line continued to cause Nemesis pressure. They got three breaks, one to make it 8-8, one to take the lead at 10-9, and once to give themselves some breathing room at 12-10. Nemesis could find no more breaks after their run of three to end the first half, and that was the difference in the game. The win capped off a turnaround Sunday performance from Phoenix. With three wins by a combined three goals in pool play, they went undefeated on Saturday, but looked far from convincing in doing so. They weren’t perfect on Sunday, but they were much improved in those regards, and it paid dividends against the increased competition level of their semi and final. Phoenix survived their down games on Saturday and then rebounded to play better on Sunday. At Pro-Elite Challenge, Phoenix played the surprise role, going from the no. 15 seed all the way to the semifinals. They had to face a different challenge this weekend as the top seed, with other teams getting to relish in the underdog role against them. They were a little shaky in their new role at first, but they were able to stick the landing. I discussed in my tournament preview how ESC has treated us to some surprising runs from teams in the past. Grit didn’t get to go on a true run because of the lack of true bracket play, but they still take the title as tournament Cinderella. Based on how they played on Saturday, they had a very real chance at pulling off an upset or two. They showed that again on Sunday when they beat Showdown. Their final game against 6ixers was not close, but their weekend results were still that of a team that was incredibly competitive with many other top 20 teams. Coach Samantha McLellan said the team has been growing over its four year existence, but this Grit team looked much improved from even earlier this season. McLellan explained their early season struggles to be growing pains, with many first year players on the team, and she said that this weekend they were able to “put it all together.” McLellan also expressed her disappointment with not getting a chance to follow up their impressive pool play with an opportunity in quarterfinals. “I feel like we would have had a good chance to win in quarters, and in semis you never know,” she said. Grit looked capable of hanging with every team at the tournament at ESC, and it didn’t seem like a fluke. They weren’t over reliant on a couple of star performers and they played tenacious defense. It’s unlikely that we’ll get to see Grit at Nationals this year, but there is no question that they were big winners on the weekend. Despite the loss in the final, and the loss to Schwa on Saturday, Nemesis still had a positive weekend. It was difficult to pick out who Nemesis’ most impressive player was. While every team would like to have true starpower on the roster, Nemesis did an impressive job of playing team-oriented ultimate on both sides of the disc, without asking any two or three players to do too much. They did struggle to slow down Jenny Wei in the final, but otherwise Nemesis’ “all hands on deck” approach was impressive. Hack was a little disappointed with her team’s inability to fight through a lack of urgency and intensity in their game against Schwa, but seemed pleased with the weekend overall. If just a moment or two had gone differently in the final, then Nemesis could have walked away as back to back ESC champs. They seem to be right on the edge as a Nationals quarterfinals contender and their weekend should do nothing to hurt their confidence in that regard. Now they look forward to Great Lakes Regionals, where they’ll hope to win the region for the first time since 2015. Despite missing several of their most important players, 6ixers put themselves in a very comfortable position in terms of earning a bid for the Northeast. Realistically, that was probably their only real concern ahead of the tournament anyway. They missed out on the semifinals thanks to their loss to Rival at the end of pool play, but 6ixers got plenty of play time for the depths of their roster, and moved up to 9th in the rankings in the process. If you had to nitpick, you could say their weekend exposed a lack of depth at the handler position. Without Lauren Kimura on the O-line and Molly Lewis on the D-line leading the team’s offenses, they struggled to move the disc more than usual. But what team wouldn’t be worse off without two of their top three throwers? 6ixers used ESC as an opportunity to develop their roster and did so while increasing their chances of making Nationals. That can only be seen as a win. Rival had their first above .500 tournament of 2018 at ESC. Their upset over 6ixers put them in semis, where they lost a tight game with eventual winners Phoenix. They then blasted an out of sorts Heist to take third place and finish the weekend 4-1. Rival struggled mightily a couple of weeks ago at U.S. Open and this weekend was a big step in the right direction. Their narrow win over Wicked was a bit of an eyebrow raiser, and they are still too reliant on Sophie Knowles making ridiculous plays. But Rival were much better offensively in Columbus than they were at U.S. Open, and their blowout win over Heist helped them leapfrog over Nemesis in the rankings, which could mean they get the no. 1 seed at Great Lakes Regionals. The weekend went about as poorly as it could have for Showdown. Really, though, it was their Sunday that hurt them. Their loss to Heist on Saturday hurt them in the rankings, but if they had avoided their losses to Grit and Pop in consolation play, they’d still be in the top 16 right now. Instead they have to wait and hope for favorable results around the rest of the division to pull them back into a bid spot. Showdown’s biggest weakness at ESC was a lack of elite throwing. They have gifted cutters, and they’re capable of getting turnovers on defense. But they couldn’t make plays through the air with the same consistency as the top teams of the tournament. As things stand, Schwa is still in bid territory, so it can’t really be said that they had a worse weekend than Showdown. But based on how those two teams played–at least on Saturday–there’s not many who would pick Schwa to beat Showdown if the two played head to head. They beat Nemesis 13-9 on Saturday, but Nemesis admitted after the game that they’d struggled to play the game with a usual intensity, having already locked up the pool. Schwa struggled mightily on offense at times. Mariel Hammond was asked to do so much for them, and they’ll have to do a better job of supporting her if they’re to defend their bid. The North Central came into the weekend with two bids and a third team within striking distance of the top 16. That fringe team, Minneapolis Pop, did sneak inside the bid cut off. Unfortunately for the North Central, the two that had been inside it both fell out. That wasn’t an all too shocking development for Wicked, who had an undefeated record thanks to a soft schedule. But Heist’s departure from the top 16 was a surprise. After Saturday, Heist looked to be in great shape. They were one of the most impressive teams in pool play, and they sat at eighth in the rankings. They even looked fine for much of the first half in their semifinal game, up a break at 6-5. But in three halves of ultimate, everything unraveled for them. They wound up being broken by Nemesis into halftime of that game, and then were broken five more times in a row after the half. Their 6-5 advantage turned into a 12-6 deficit. They got a hold and a break to make it 12-8 before finally losing 13-8, but the seven point run was a devastating one. They then struggled again against Rival, losing 13-7. Those three halves, getting outscored 19-9, cost them 84.45 points and nine places in the rankings. Pop has to be as frustrated with the way Heist finished as Heist is, if not more so. Pop had three solid wins, and their only two losses were 13-12 defeats to Phoenix and 6ixers. But that impressive performance will mean virtually nothing if the region doesn’t come away with two bids. These seven players stood out with their individual performances at this year’s Elite-Select Challenge. Comments on "Elite-Select Challenge 2018: Tournament Recap (Women’s)"